Definition Work done by the source to drive a unit charge round a complete circuit. Work done to drive a unit charge through a component or across two points. 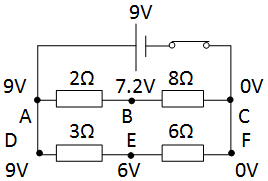 Voltmeter must be connected in parallel to the component. After connecting the voltmeter to the circuit, if the needle deflects to the left side of zero mark, simply interchange the connections on the terminal of the voltmeter. 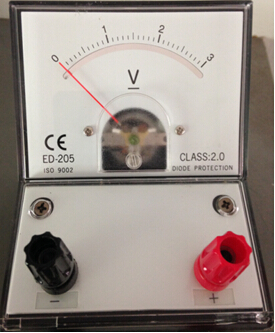 An ideal voltmeter has ﻿﻿very large resistance﻿ ﻿so no current passing through it. ﻿(Very Important!!) We cannot say e.m.f of a bulb or p.d of a cell. What does voltmeter reading show? Potential difference can be the difference of potential at any two points. It is not necessarily must be across an electric component like light bulb or resistor. Potential at A = Potential at D = 9V as they are on the same wire that connected to positive terminal of battery (9V). Potential at C = Potential at F = 0V as they are on the same wire that connected to negative terminal of battery (0V). Potential at D > E > F.
V1 = 3.0 V as it measures the e.m.f of cell. Since it is an open circuit, no current flowing in the circuit. 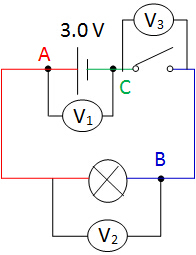 Since it is a complete circuit, B and C are actually same potential point.